While formal gardens are not generally my thing, it would have been criminal to not visit the Jardin du Luxembourg, it was only a 10 minute walk from our hotel. Visiting in January did nothing to up it's appeal, however. Still, I'm glad I saw it. The highlight? Medici Fountain. Unknowingly I approached the fountain from the backside, which was quite beautiful and has it's own name, Fontaine de Léda. From the Wiki: "In 1864, during the Second French Empire, Baron Haussmann planned to build the rue de Medicis through the space occupied by the fountain. The lateral arcades of the fountain and the crumbling old orangerie behind it had already been torn down in 1855. 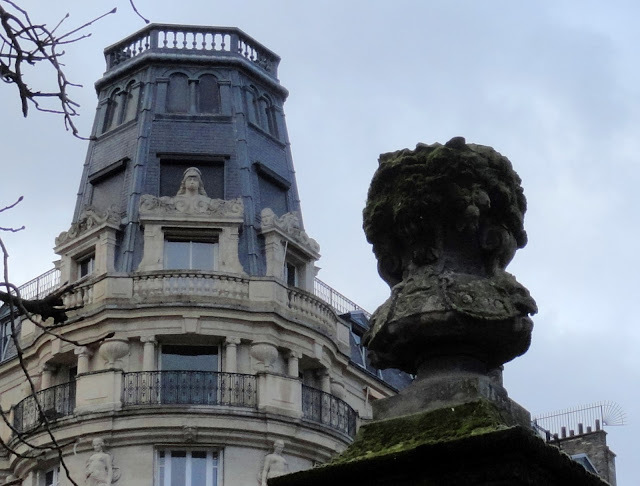 From 1858 to 1864, The new architect, Alphonse de Gisors, moved the fountain thirty meters to make room for the street, and radically changed its setting and appearance. Since the fountain no longer stood against a wall, the Fontaine de Léda, displaced from another neighborhood, was placed directly behind it. (See the Fountain of Leda, below.) He replaced the two original statues of nymphs at the top of the statue with two new statues, representing the Rivers Rhone and Seine. He restored the coat of arms of the Medici family over the fountain, which had been defaced during the Revolution. He inserted two statues into the niches, one representing a faun and the other a huntress, above which are two masks, one representing comedy and the other tragedy. He removed the simple basin and water spout which had been in the niche and replaced them with a long tree-shaded basin. Finally, he removed the statue of Venus and replaced her with a group of statues by Auguste Ottin, representing the giant Polyphemus, in bronze, discovering the lovers Acis and Galatea, in white marble. That is the fountain as it appears today." The signage is ceramic (! ), and refers to the moving of the fountain mentioned above: "In 1862 the creation of the rue de Medicis, whose trace was made largely to the detriment of the garden, forced to demount the fountain and bring it closer to 30 m to the palace. Only the arbes in front of her were preserved. This plane tree wedges between the grill of the garden." I cannot even begin to imagine how beautiful this must be when the trees are leafed out and the urns planted up. Of course they could plant evergreens in the urns, so they look great year-round, but that didn't seem to be the way of thinking here (more on that in a bit). I was about where those people are, near the fence, when I tried to look in at the landscaping. Which was about as exciting as this (photo from elsewhere in the garden). But then I had a gun pointed at me! Not this guy, but the guy three photos up. I later read the garden is now owned by the French Senate, which meets in the Palace. Okay but guns!? And can you imagine spending your day standing in that little cubicle? There were a couple of young boys who were sailing boats (or rather trying, they seemed to be having a rough go of it) as I walked by. Their father didn't look like the sort who would appreciate a stranger snapping a photo of the moment, so I did not. More evidence of a lack of desire to provide winter interest in the garden. Put something in there already!!! I could see palms through the windows of L'orangerie and knew I wanted to get inside. But was unabe to find a door that was open (and I tried them all, aware that guy with the gun was just a few hundred feet away). Turns out you can only get inside when there's a show going on. Bummer. Again with the precision pruning. I'd love to see this bit of artwork in process. I found this building outside the garden very interesting. It looks like there may have been a time when the windows/doors above the modern windows opened up. Oh! More areas I would love to get into, but were off-limits (behind a fence). Employees growing salad greens perhaps? Again with my camera poked through the fence, looks preparation for an event? Google translate: "This sculpture refers to the Roman legend that one can not withdraw one's hand from Verite's mouth that one never lied." Of course if you saw Roman Holiday you remember Bocca della Verità. Okay, the garden was closing — as in they literally were locking the gates — so it was time to wander on. Hope you enjoyed this somwhat random look at Jardin du Luxembourg. So I gather you don't enjoy a garden visit at gun point? The fountain is impressive but the garden undoubtedly has much more to offer later in the year. Probably not your favorite memory of paris. Oh I loved it, I get something from every place I'm lucky to visit. Although yes, the gun thing was unpleasant. Just saw a friend's pix of visiting Mexico and federal police with major weaponry on the street. Think I'll stay home. Guns on the street and the location being Mexico, that sounds a little less than ideal...something could easily go very wrong. Love the fountain and don't even mind the empty urns flanking the pool as they seem to fit with the swag-trimmed hedges behind. Throw a single sculptural plant in each one, like maybe a Furcraea and it would be even better. Having a gun pointed at you for taking pictures of a garden (or for any reason) would be unsettling! I'm with Linda on the staying home thing. I think my desire to see something in the urns was largely informed by the leafless trees. More life at eye-level was needed. Perhaps the French share the English disposition (from what I've seen watching Gardener's World) that the garden should sleep in winter? So very different from our desire for year-round color and interest. Maybe that guard wouldn't have been so touchy if the gardens looked a little nicer in winter. That little bamboo grove in your parting shot was a refreshing injection of green in a largely drab, grey setting. They should plant more! That's a good point I suppose, the sleeping, not that I agree with the notion. I thought of you when I took that shot of the bamboo, glad you saw it. It did seem a little incongruous, but welcome. Well, that must have been disappointing, to say nothing of frightening. Those sad little plants all in rows. Great pictures of the fountains and architecture though. And thanks for digging up and sharing the history. The lack of winter interest is exactly why I didn't make the trip out to Versailles. Although I'm sure I would have found plenty to interest me, I preferred to stay in the city. My impression when I visited England and France, many years ago, was that the French were more relaxed personally (not reflected in their tightly controlled gardens) while the English had fabulously naturalistic gardens but were uptight in the extreme, personally. I was especially ompressed by the toilet paper with "property of the BNritish government printed on every sheet. Wow, and where did you see this toilet paper? Did you visit the queen? So just what was he trying to convey by pointing a weapon at you? You hardly look like a terrorist! Oh but a middle aged women with a camera, isn't that the perfect disguise? A gun pointed at you! Yikes! It's too bad so many of the areas were closed off: It's frustrating when that happens. The statuaries in Europe are so fascinating! I would imagine that many of the areas that were of interest to me, and closed off, are of little interest to most. I'm actually surprised that the French guards were so aggressive in what's presumably an area frequented by tourists but then they've had considerable issues with terrorism. I prefer the wonderful vertical gardens you showed earlier to the formality of spaces like this. I remember that Versailles was also very formal but then I expected it there due to the historical context. The tall, well-pruned trees are very impressive, though! I've got a couple more Parisian gardens to share, both of them much less formal. I'd be pretty surprised if there weren't armed guards outside the US Senate chamber.